You can say a lot of things about the members of Smash Mouth—and we have, at length, as our archives will attest—but they do seem to be endlessly enthusiastic dudes, content with their status as memes, and happy to play along with jokes or help a buddy eat a ridiculous amount of eggs for charity. So when a fan—responding to the band’s Twitter account, which had just expressed its love for indie rockers Car Seat Headrest and their 2016 track “Drunk Drivers/Killer Whales”—suggested that the two groups should team up, the members of the “All Star” band were game. And so, as it turned out, was CSH’s Will Toledo, leading to a collaboration that finally bore fruit today. 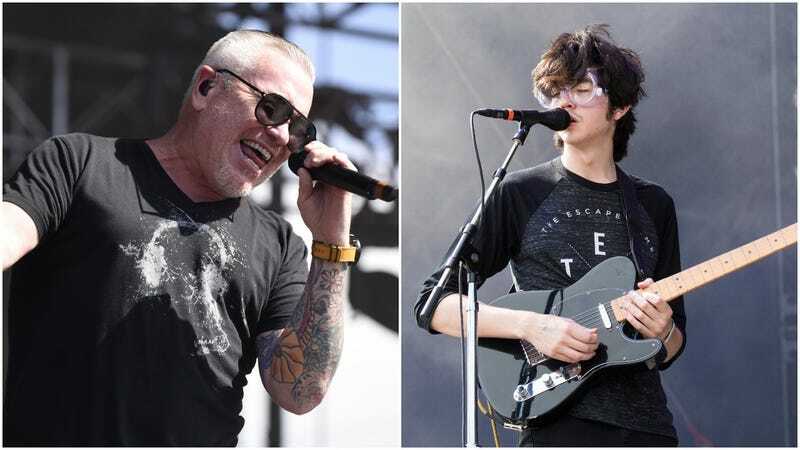 Unfortunately, only half of the Smash Mouth/Car Seat Headrest team-up project appears to have made it onto the internet proper as of yet—Toledo possibly being more preoccupied with the release of his new album Twin Fantasy than with making sure you hear his cover of Astro Lounge’s “Fallen Horses”—but the half that’s out there is pretty amazing: A Smash Mouth version of CSH’s drone-y “Something Soon” that undeniably sends it walking on the sun. Both tracks debuted earlier today on Jenny Eliscu’s SiriusXMU show.